BINA NUSANTARA is celebrating 34 years of fostering the country’s education, thanking all Indonesians for the supports and cooperation. 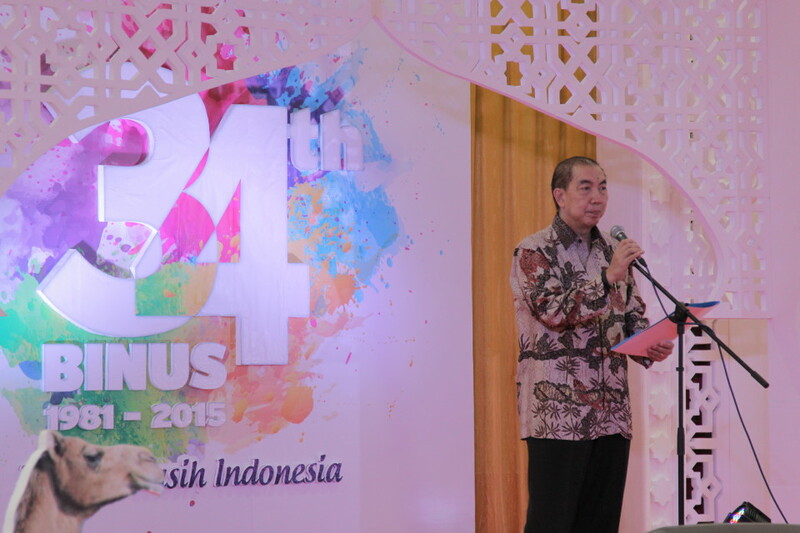 The rapid development and outstanding achievement is the pride of BINUS, as well as of Indonesia. Originally established as a computer-course institution in a garage, at the present BINUS has been a gigantic educational institution. How is it possible? Yes, BINUS has been developing rapidly – now providing education from pre-school to doctoral degree. Isn’t it amazing? In 2014,BINUS had the second assessment and was rated 3 stars by QS STARS. However, for Teaching, Employability, Facilities, Access and Engagement indicators, BINUS was rated 5 stars. BINUS was awarded Superior Private University (Perguruan Tinggi Swasta Unggulan) in the private-university coordination area III (Kopertis Wilayah III) DKI Jakarta for the System Development, Quality of Learning and Featured Works. 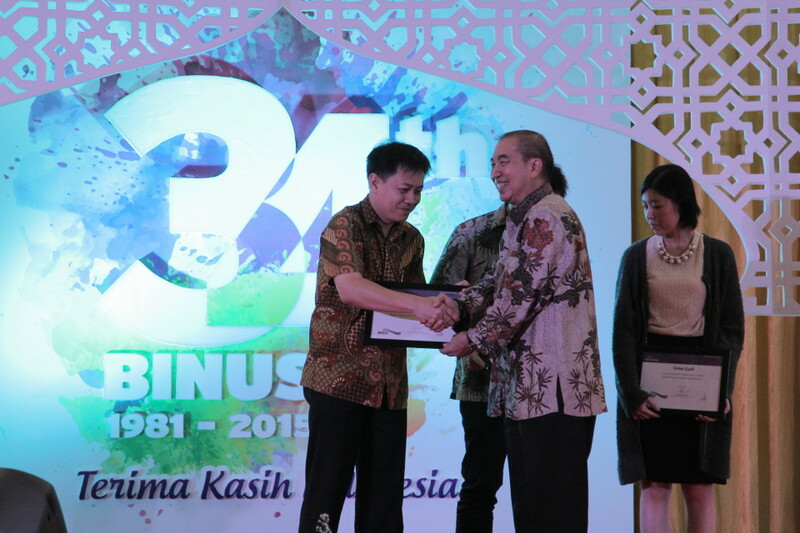 BINUS received the 8th MAKE (Most Admired Knowledge Enterprises) Study Award consecutively since Dunamis Organization cooperated with Teleos – The KNOW Network in England awarded BINUS as the best known and admired by public for its development of knowledge management of education in Indonesia. In 2014, BINUS was chosen as the 20th best institution in Asia. InIndonesia Quality Award 2013, BINUS was awarded for its excellent level of performance based on the assessment’s result. The result was “Good Performance” in the Band of Performance Excellence Achievement for medium companies. Furthermore, Bronze Award was received for the medium organization category in the nomination of Performance Excellence Score Growth Achievement. In addition to those, BINUS Group has expanded to reach all over Indonesia by establishing BINUS Learning Community (BULC) in Palembang (2014), Semarang (1/15) and Malang (10/15). In the future, BINUS is planning to open new campuses in Bandung and Malang, and next year, the International BINUS School in Bekasi. 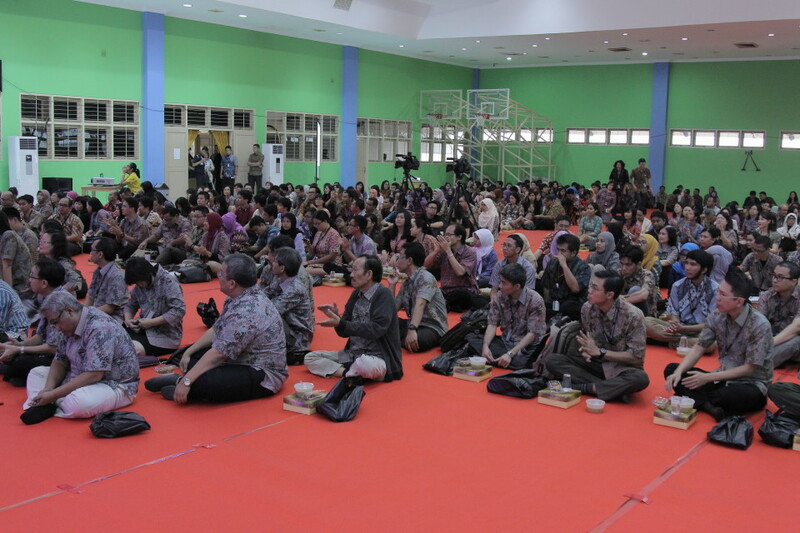 In developing its programs, BINA NUSANTARA Group also invented a new non-formal educational program – RISE. It is an English course combining language and technology in the learning process. The market is children aged 2-12 years old. 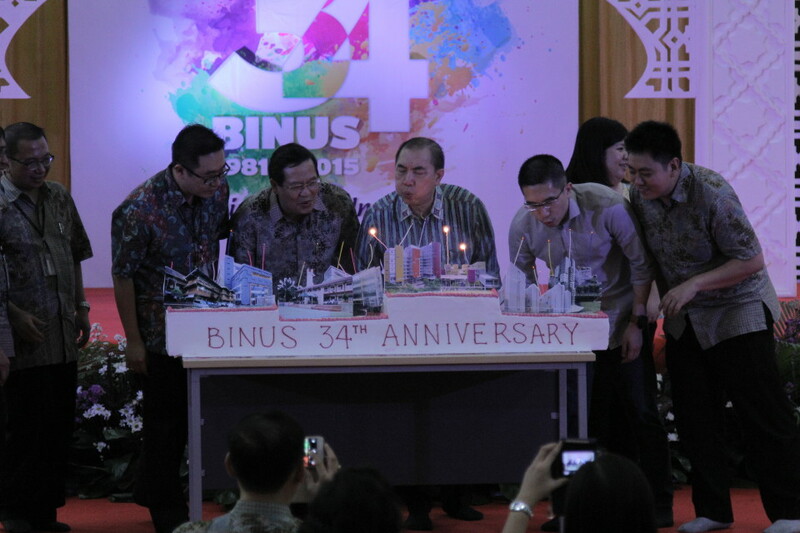 Certainly BINUS is grateful for all these achievements. Not only them, but Indonesia also feels proud to have an international level of educational institution. 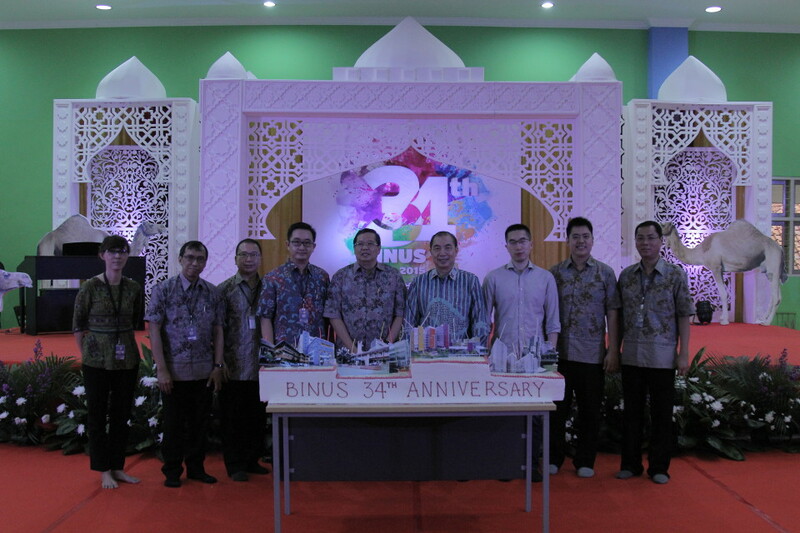 As the real form of gratitude to Indonesian people, BINUS gathered all employees working all over Indonesia to celebrate the Anniversary on Wednesday (1/6). The celebration presented special performances from Kolintangklung (BINUSIAN kolintang and angklung club) and Kanyadian Idananta, the winner of BINUSIAN X Factor accompanied by BINUSIAN ensemble. 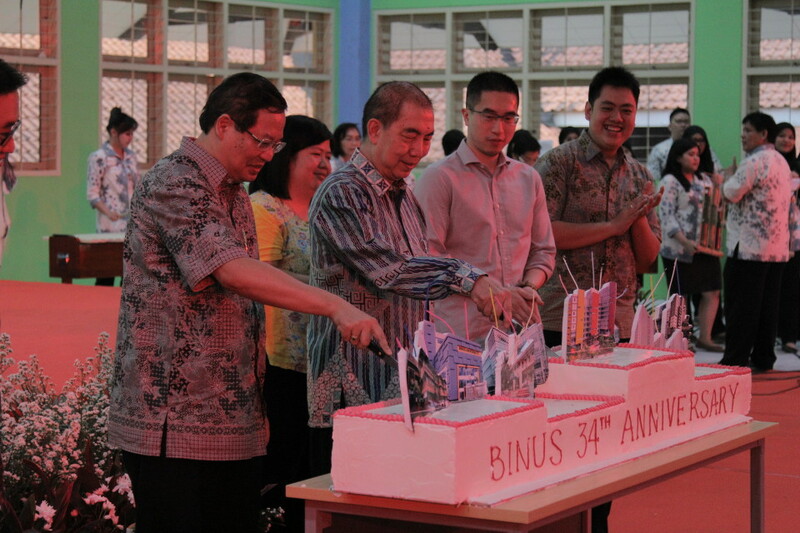 In this event, BINUSIAN Leaders also gave 34 cakes to other BINUSIANS as a symbol to thank the employees for their hard work, ideas, and prayers dedicated to BINUS. On the next day (2/7), BINUS invited surrounding people, affiliated partners, representatives from industries, scholarship awarders, and local government of Kemanggisan. 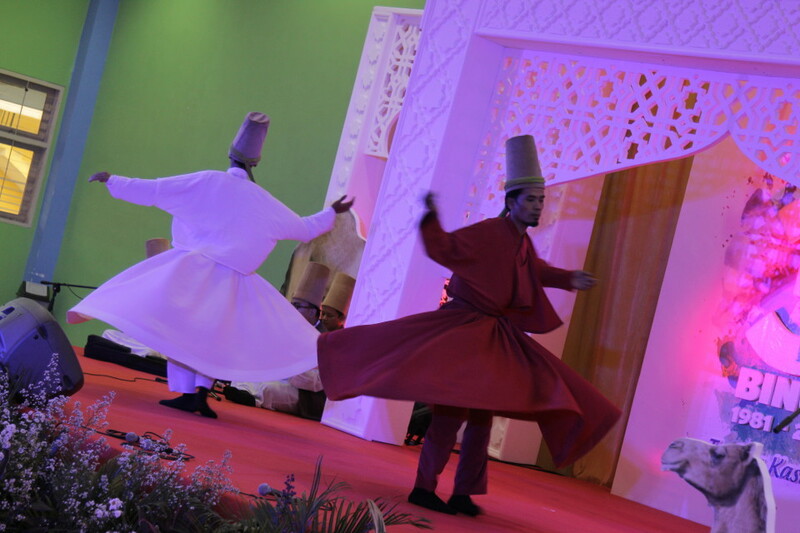 The guests attending this Anniversary were those who helped and succeeded BINUS in fostering the country’s education. Finally, the celebration closed with giving away sembako (basic food) to people live around the campus.